Reflect: It’s an interesting thing how endlessly the human heart desires to know that it is loved. In His hands, in His love, I discover more and more who I am and that I’m deeply loved – beyond my dryness, beyond the stresses of every day. I begin to hear that He calls me by name with every beat of His Sacred Heart. 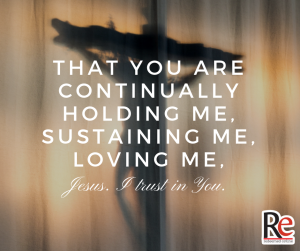 Jesus wants to be my refuge…drawing me from the million other ways I try to satisfy this longing for love. Only in Jesus does this infinite longing in my heart find an infinite response. Share: Today, open your Bible to Isaiah 43. In a private place, stand up and read out loud verses 1-7, claiming the truth of Almighty God’s particular love for you. Wherever it says “you” or “your” insert your own name and/or nickname(s). *Note: There is power in His living Word, so open wide your heart to His active love for you.